Organiser: The contest is hosted by NIT Warangal. This is the elimination round for South India's second largest technical fest Technozion's National Programming League. This will be a qualification round for its final round (which is held onsite at NIT Warangal). This contest will be open for all. Registration for prizes : If you are willing to join us for the on-site round please register here. 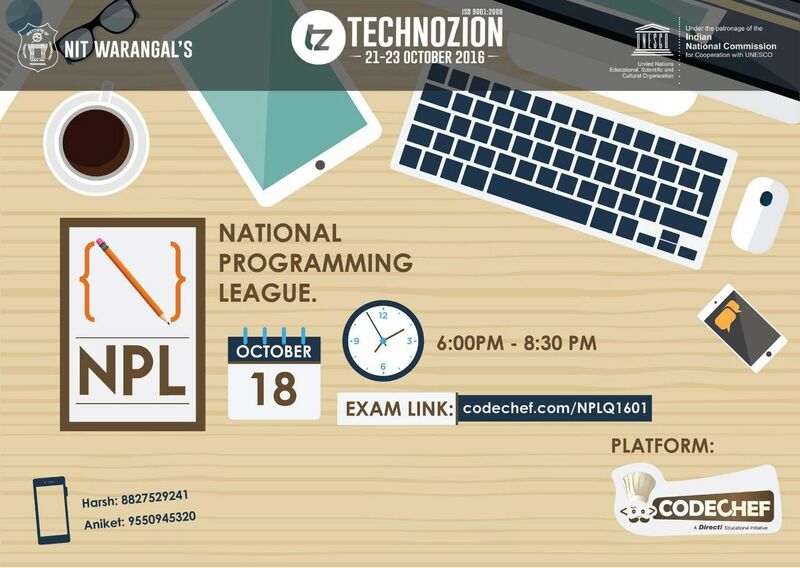 Please contact npl@technozion.org for any queries during the contest. In problem NPLELF the constraint on Ai has been changed from 2<=Ai to 1<=Ai. We regret the inconvenience. There was small problem with problem "NPLELE" test data, we have rejudged the solutions. Fortunately there was only one solution which was affected.